The Coaldale and District Fire Department just welcomed a brand new county engine. The truck arrived on Tuesday, April 24, at the Coaldale Fire Department. The engine was purchased by Lethbridge County and will be used to respond to calls in the county. 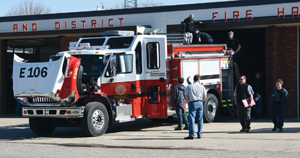 The new fire engine is replacing the county’s old engine at the department, as part of the county’s fleet replacement. Fire engines typically need replacing every twenty years. The old engine was 21 years old when it’s replacement arrived, as it took a year to build once the county placed the order. Although he joked that they might have some trouble getting the truck into the fire hall due to it’s size, county Reeve Lorne Hickey said he was glad to see to arrive. While the old engine had a crew-cab design, the new engine has a custom-build compartment that can seat four firefighters with their breathing apparatus, and doubles as the pump operator’s control panel. As the compartment is enclosed, it protects the firefighter from the elements and allows them to focus on operations while they’re fighting fires. Compared to fire engines earmarked for the town, Darryl Beaton, emergency service coordinator for the county said they needed to make sure it had a bigger pump and could hold more water, as it can be hard to find water in the country sometimes. “It’s not the first one of this design in our fleet; we have others that are this configuration in the fleet and it’s just proven to be a good design for us,” said Beaton.